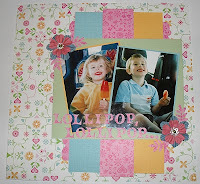 I saw this challenge on Daydream Believer's blog, it's from The Scraproom Blog. There is a sketch to follow by Julie Bonner. This is Padme and Rancorman aged about 3 and 6. They have big smiles on their faces because Dad allowed them to have a lolly in the car on our way home. I have used 12" x 12" papers from DCWV "The Stack 6". It has 180 sheets and I have had it about a year now and this is the first time I have used it. I will have to start using the papers instead of taking the block out looking through it and then putting it back. I have been practising with the Craft Robo again and made the title "lollipop, lollipop... and scallop border (you can't see it very well as I did my pictures 6" x 4" and then mounted them so the paper underneath was quite large). I am getting the hang of the Robo software now and am really enjoying playing. Hope you like my layout and are having a good weekend. This page is absolutley adorable! Love the bright happy colours, they match the bright happy smiles. Gorgeous pics. Love this - aren't their grins just the best? !